Don’t be mistaken thinking this is a small house stood at the bottom of the garden. Lifetime’s plastic sheds 10 x 8 feet incorporate double doors & windows centrally along the length to help organise storage besides exhibiting their idyllic presence. If a low-maintenance fascia floats your boat together with broad access & a highly appealing modish appearance, Lifetime’s 10 x 8 ft facility is worth checking out. Manufactured from polyethylene signifies the end to the rust, rot & peeling problems wood & metal sheds are prone to, leaving the mere maintenance duty to involve embracing the occasional hosepipe shower to swiftly revive construction day’s pristineness. 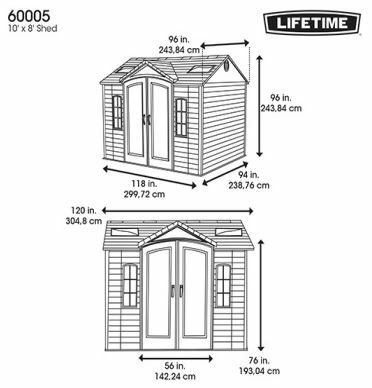 Lifetime hold a prominent position in America for garden sheds trumpeting out weather-resistance combined with durability & sturdiness in addition to their exhibit of picture-perfect presentations. This facility is part of Lifetime’s large family of outdoor storehouses, many opt to consider the alternative 8 x 10 footer on account of the true apex-roof design & double doors incorporated across the width however decisions merely depend upon the layout of a home-yard’s landscape to how the shed’s access serves your requirements. Inspect who’s competing with Lifetime’s weatherproof manufacture. Choosing our particular storehouse was conditional to the build comprising a double skinned structure fastened to a steel framework for robustness, to ascertain the facility stands up to the elements yet weatherproof to fully protect storage. Lifetime’s manufacture constitutes High-Density Polyethylene (HDPE), moulded into a twin walled structure. Internally is where sturdiness comes into fruition, virtue of an abundance of deep resin ridges meanwhile each fascia panel fastens into position by interlinking with neighbouring panels whilst securing to the steel infrastructure. The outer-walls are moulded to resemble wood-panelling incorporating the feel of coarse grain texture running throughout the surface meanwhile tinted desert-sand to accomplish a spotless presence that radiates warmth. All Lifetime products are UV stabilised commencing their manufacture. The toughened additives protect the composition from suffering sun-scorch fractures along with the prevention of colour-fade. 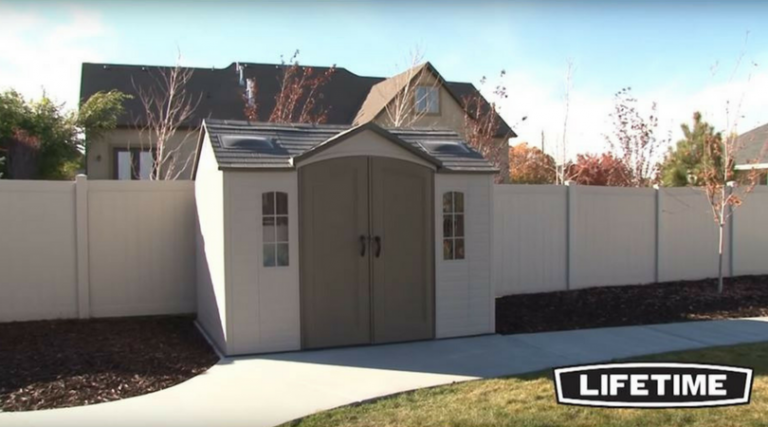 Admirable from a distance & up close, Lifetime’s fascia panels are designed for durability meanwhile immune from catching the disease of weather-rot, therefore do not require any of the annual preservation & nurturing treatments wooden sheds demand. Upkeep merely involves an expeditious wash with a hosepipe shower to freshen the looks meanwhile a soft scrub with household detergent soon dislodges anything hard to shift. It’s worth noting that Lifetime’s High-Density Polyethylene plastic is 100% recyclable therefore when the time comes to replace after a long-life of serving, this resin can be re-manufactured & moulded into the future’s innovative plastic designs. Architecturally, this roof comprises two apexes, the main ridge runs full length across the peak whereas the add-on apex incorporated above the doors enables the high-arched doors to deliver lofty access. 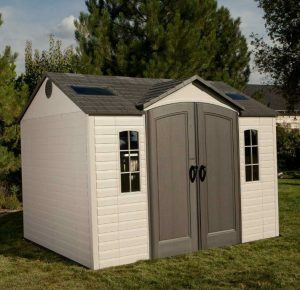 Although an additional apex may discourage a few, having read reviews from sheds stood for 10 years+ without any issues, certainly provides weatherproof assurance. Lifetime roofs comprise high angled peaks running up to the apex ridge. In return, this effectuates instant drainage when showers fall beside reciprocating an elevated ceiling height to overcome an adult wandering around crouched-over nor receiving a whack to the noggin when inside meanwhile the roof’s steepness & extension beyond the fascia walls stops puddle development on top and leaks-in where they connect. The roof’s polyethylene manufacture is structured into a similar double skin as the fascia panels albeit moulded to simulate classic slate tiling. On account of polyethylene’s durability to continue-on long-term without being affected by weather-rot escapes the rapid disintegration and replacement issues roofing felt is susceptible to. This 10 x 8 ft roof structure comprises a metal framework to which the roof panels secure further to being additionally shored-up by 3 A-frame steel trusses extending internally across the roof expanse, these join steel supports running up the walls conducing a sturdy overall construction. One huge advantage we find with the resin design concerns their built-in floors. 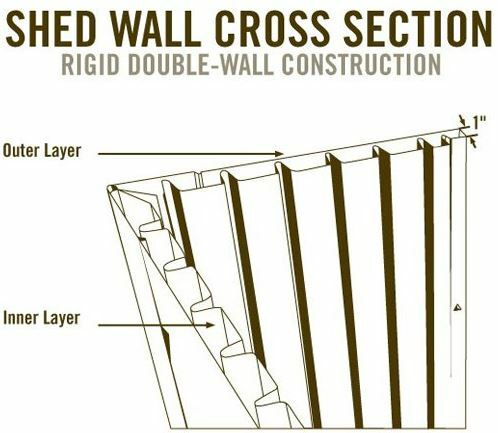 The fascia’s wall-sheets interlock with the floor’s perimeter creating a blockade to pests, waves of leaves and puddles of rainwater thereby helps maintain a clean interior which in return ensures a more preserved environment. Lifetime floors are described hard wearing however this is wholly reliant on stationing the shed on solid foundations. Obeying with these stipulations increases the floor’s longevity to handle the burdensome stresses of rolling the mower inside. 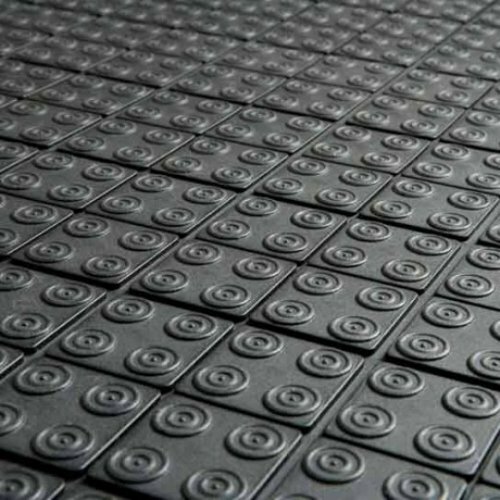 The floor’s toughened manufacture of resin is moulded into thick bedded sheets comprising an anti-slip surface that withstands stains when oil & solvents are spilt, only requiring a wipe up when the unfortunate happens. 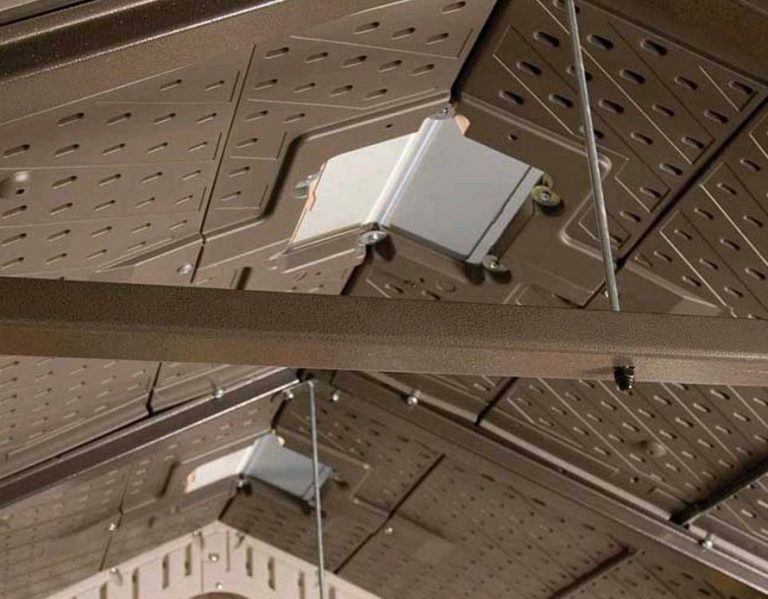 The floor contains anchor placements embedded within for grounding the shed down onto the foundations for the purpose of improving the shed’s stability against adverse weather. 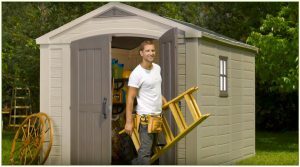 Presuming you’re after a shed that illumines plenty of daylight to the interior, provides a decent height to accomplish a pleasant atmosphere, eliminates that claustrophobic or bent-over feeling when moving around inside meanwhile caters to store long-handled tools & ladders, this shed certainly delivers to all these specifications. Embedded within the apex, 2 large skylights & 4 small skylights deliver a profusion of daylight to flood the facility. Couple these with one window at the rear of the shed and the two windows either side of the double doors, there’s an abundance of natural light delivered. The skylights & windows constitute impact resistant polycarbonate meanwhile the one at the rear of the shed can be installed into either of the 8 ft sides, this window opens half way if more ventilation is required. Air vents deliver a blessing to plastic sheds in humid conditions. They situated on opposite sides of the 8 ft width generating a throughput of fresh air to circulate the internals which helps keep storage in prime condition by eliminating those sweaty atmospheres & saturated walls yesteryear’s resin sheds fell victim to. Included with this 10 x 8 ft are two 90 inch shelves & two corner shelves which are handy for light items meanwhile a pegboard strip including hooks hangs gardening tools against the walls. Another popular storage solution regards exploiting Lifetime’s generous ceiling height by installing free-standing shelves or those large plastic stacker boxes. Looking for easy access? This Lifetime model delivers a broad entryway operated by a pair of doors comprising a high arch design, making the process of carting gardening equipment & patio furniture in and out a straightforward duty meanwhile the advantage of twin doors across the length aids to better organise storage to either side of the shed as well as at the back. Both doors open right back generating easy access whilst the arch design delivers more height to prevent a crack to the nut on entry. During windy days, the left door can be kept shut by using the two deadbolts fitted to the internal side that embed up above and below the door architraves producing closure. Similar to the walls & roof, the doors manufacture constitutes a dual lining of polyethylene for sturdiness meantime reinforced with textured steel enhances security. Galvanised steel hinges run the doors entire length, the pins are secured into the door architraves during roof assembly to improve the doors robustness & swing strength. 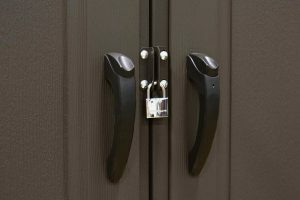 Pressing the top of the door handle operates the latch mechanism during opening & closing meanwhile when both doors shut, two metal clasps join together for inserting a padlock & locking. All manufacturers sing from the same hymn sheet with regards to the importance of shed foundations, shame sales sites don’t stipulate the same. Preparing a solid material such as wood decking, paving or concrete or existing asphalt & tarmac all produce ideal solid substrates however whichever is preferred, must be laid flawlessly level. Not only do level foundations operate sweet swinging doors and prevent a skewiff standing shed, you’ll find the panels align at ease resulting in an efficient installation meanwhile the floor will manage long-term strenuous storage stresses as well as attain a firm fix when anchoring down. It has to be said, those who don’t conform to the manufacturer’s foundation guidelines many times present themselves with difficulties during assembly. The build requires 2 people using household tools & a low-torque power screwdriver to work their way through & implement the order of construction steps. The process is like one gigantic self-assembly furniture project involving aligning & securing panels & fixtures. Feedback received confirms why this 10 footer is such a popular model. The idyllic appearance is destined to complement home-yard surroundings, radiating desert-sand tones whist presenting modish style meanwhile the twin doors centred along the length aid to organise storage either side. Imperishable polyethylene assures low-maintenance, upkeep merely involves the speed of a shower or soft scrub when the grime appears to swiftly revive appearances meanwhile the double skinned fascia panels reinforced around a steel infrastructure further enhance stability. No wonder it’s a popular model. Thumbs up from me, what about you? 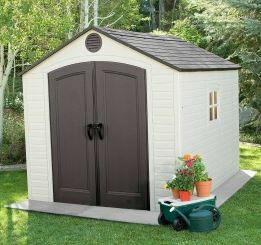 Hope this Lifetime 10 x 8 ft plastic shed provides inspiration for your storage needs. Share your favourite shed design with doors centred along the length including any Lifetime queries below. Please share Lifetime’s 10 footer. Thank you. 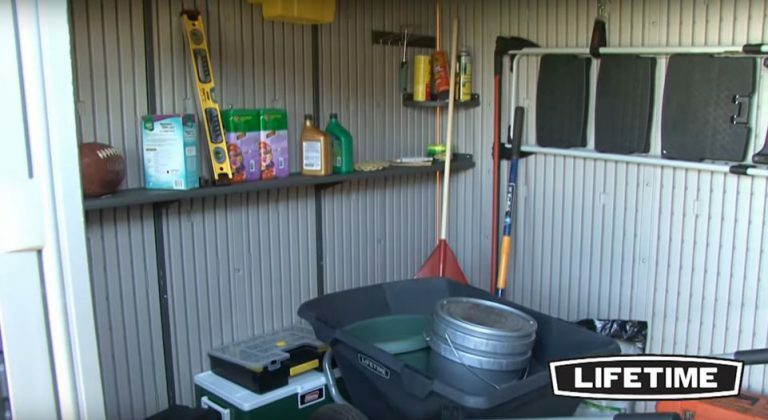 Hi Simon, thank you for an excellent review of the Lifetime shed. I just love this shed, however, I have some questions. *. 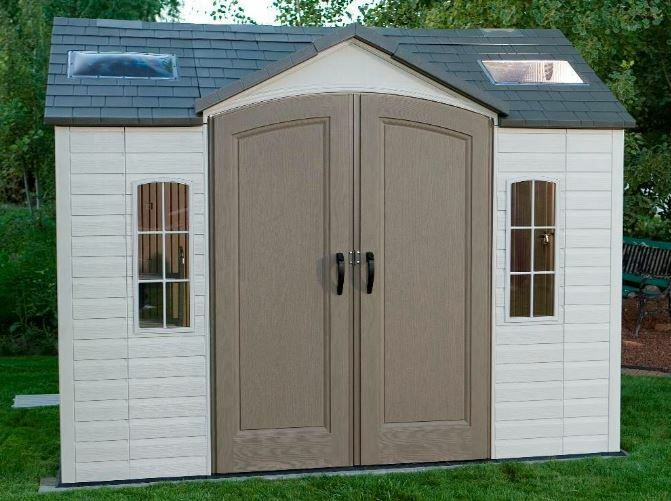 Is the Lifetime 10×8 shed available in any other colours or just Desert Sand? * I am lucky to have a level surface for this in my garden so my question is, for an average DIY person like me would I be able to construct this with help from a friend? OR would I better off getting a local handyman? Hi Moni, thanks for dropping by to investigate Lifetime’s 10 x 8 ft plastic shed. The reason I also like this shed regards the layout. When you have centred double door access positioned along the length as opposed to the conventional width-way entry, this design opens up additional storage potential. You are able to split storage into 3 sections here; one section at the back of the shed across from the entrance and the other 2 sections on either side. Mucky gardening equipment to one side, patio furniture sheltering on the other. This particular model has only been developed displaying desert-sand shade. Lifetime alternatively manufacture a silvery-grey Rough-Cut 8 x 10 ft shed with doors opening from the width meanwhile Duotech manufacture an 11 x 7.5 ft customizable My-shed structured with a similar layout meanwhile provides the option of painting the fascia panels in your colour choice, using easygoing acrylic emulsion. Constructing a resin shed this size from the correct foundations is straightforward & doable for a couple of enthusiastic DIYers. The premise of the build requires installers to follow the order and implement a rather long series of instructional steps, similar to assembling flat-packed furniture however this construction represents a much larger scale and will probably take at least a day to construct. You may find a second day is required to finish off constructing. 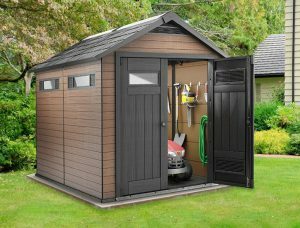 I fell in some luck when finding your article on plastic sheds, where I live I have no garage only a basement to store my garden tools and supplies. How would I have to prepare the surface for a plastic shed, my yard is hilly with no flat places for a shed? 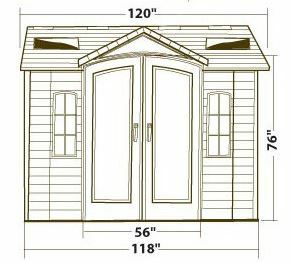 Is there any companies who prepare an area for a shed i could contract out? 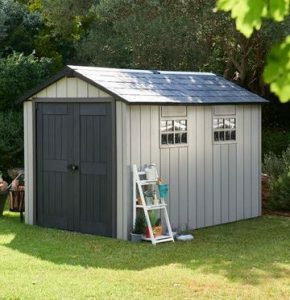 Having a garden shed solves so many outdoor storage solutions enabling you to make more room in the home and basement by harboring all that outdoor gear. They’re great for gardening equipment, tools, barbecue storage, kids toys , parking bikes and storing patio seating and accessories, the list is endless. The surface for a plastic shed has to be solid and level, a wooden base or concrete foundations making sure they are perfectly level produce ideal bases. Solid level foundations aid in assembly where all the panels align plumb for a quick efficient build, the finished construction doesn’t lean, the doors line up correctly and the floor serves for heavy duty demanding use. If your yard is hilly with no flat places and wish for help in preparing the correct foundations, I would contact a handyman or builder in your local area who could install your foundations in a day. Tell them what your foundations are for and provide the dimensions stipulating a solid level flat base. Thanks for your interest in the Lifetime Sheds and dropping a comment. Preparing foundations depends on your DIY skills really. You have a choice of wood, concrete or paving slabs. The purpose is to have a solid level base for the shed to sit on as it makes assembly easy and serves the floor as hard wearing. So, you have the option of preparing the foundations yourself or do what many people do and get the experts in to lay you the solid level foundations for your size shed. I can’t see why it won’t serve these purposes you mention here. These sheds include built-in ventilation that provides a safe environment due to fresh air being allowed to circulate all around internally and there’s plenty of daylight allowed to flood the shed through the skylights and windows. So yes, there’s plenty of other potential uses, looks just like a house sitting at the bottom of the garden. Simon, excellent article. 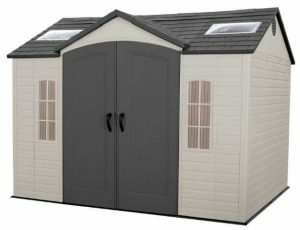 I’m in the market for a shed and can’t decide on a model. I need enough floor space to accommodate both a lawn mower and a snow blower, and in the future some pool equipment. The lawn mover is a push mover with a 21″ deck and the snowblower has a 24″ deck, both of which clutter up my garage at the moment. Looking at them every day is nagging me to get some outside storage for them as soon as possible, but at which size? We have about ~3000 square feet of back yard (50’x60′) so space might be an issue if I end up installing that above ground swimming pool in the spring we’ve been planning the past year or so. So a question for you. Which model and size would you start looking at if you have my set of challenges in front of you? Taking all things into consideration, backyard size, future plans, etc. What is the best shed you could recommend for my situation? Appreciate the time to respond, Simon. 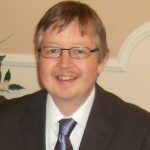 Thanks for the great article and I love your website. Keep up the good work. Thanks for calling in and your interest in making a low maintenance future. Sounds to me like you’re looking for about 6ft x 6ft + shed. We opted years ago to purchase the Keter Factor 6 x 6ft shed and we’ve been very happy with how it serves our storage needs especially the low maintenance benefits regarding a hose down rather than the yearly re-staining and re-roofing duties wooden sheds behold. Lifetime and Suncast are definitely the firm favourites in the USA as they are very well established however there’s some new models by Keter coming onto the market. The Keter Fusion is a traditional looking wood / plastic composite shed which is receiving excellent results all round the UK and USA and then there’s my favourite, the Keter Oakland sheds. There’s some new designs just about to hit the market with the Oakland facade but they’re so new I’m struggling at present in the USA finding where to link for you to have a look, As soon as they hit an online store, I’ll be creating reviews on the entire range. Here’s another popular option worth considering. I was talking to a guy the other day regarding horizontal sheds to which he’s opted for. The Suncast Glidetop. He became frustrated with planning laws and decided to purchase 2 Suncast Glidetop sheds. They fit perfectly under a 6 ft fence which suits him fine as space is tight, you’re not looking at the height of a regular shed which pleases him and it gets around all the planning rules and regs. Similar to you, he wanted to clear his garage out with a few bulky equipment and couldn’t be any happier. 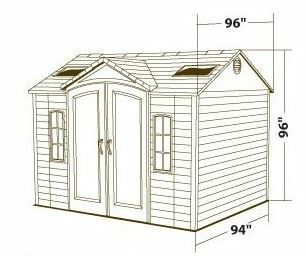 A great decision but you will have to measure up to see if this shed will fit your lawnmower and snow blower. Thanks again, Simon. I’m going with your advice and a 6×6 shed. Low maintenance is the 2nd most important goal (after utility) and an occasional hose-down would fit in nicely with our lifestyle. Thanks again for getting in touch, I’m glad we are able to help. We’re really happy with our choice. 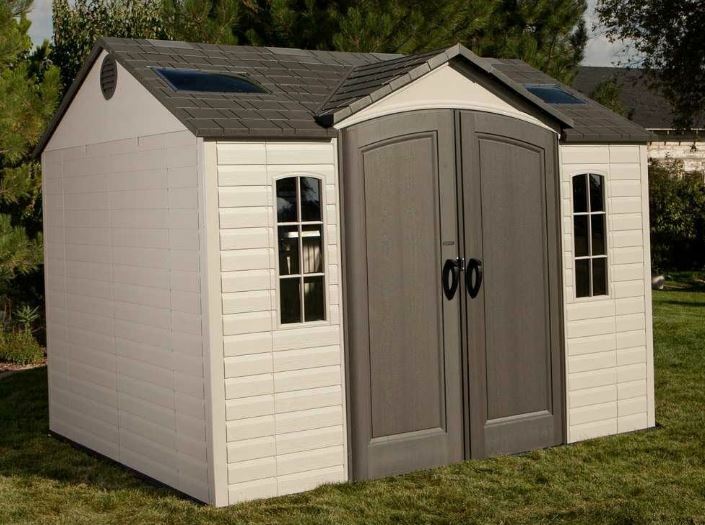 For price compared with quality, it’s an ideal shed for us. Certainly beats the heck out of maintaining duties I must say and fits our storage purposes. Yeah, a hose down usually suffices to bring it back looking new again.